It was our first journey together and of course it couldn’t go without any adventures. Back to those days we found out that it takes two to tango. Where else you can check the abilities of your person if not in the mountains. We chose High Tatras for it! When you travel to High Tatras in the Summer all you expect is a peaceful day strolls with a cleared tracks (even the paved ones) in a hilly area. But it is way more different what you will get if you decide to visit these mountains in a winter time. When I met Justinas, we knew that both of us love travelling. Shortly after our relationship began, we set the date, packed our things and left the country through the endless roads of Poland to Zakopane without an accurate plan. It was four of us in the car. Two couples: Eisvė & Justinas, Eglė & Andrius. Girls names sound similar, right? We were going on a hiking trip in the High Tatras mountains for a weekend. The High Tatras Mountains are Poland’s only alpine-type mountains and the closest mountains available for Eastern Europeans. Zakopane is the great base for hiking in the area. All trails are available from any place you will stay at the town. If you come in February the days are short and cold. But the weather conditions are nearly perfect for skiers. And almost none of the hiking trails are available during the winter time. Either there is a danger of avalanche or the trail requires to have a proper gear and knowledge or at least a guide. We didn’t have the gear so the choice was simple. We put our hiking shoes and tried stay in the recommended safe areas. Morskie Oko is emerald-green lake which is entirely surrounded by the mountains. Standing on a frozen lake gives you a feeling as you would be in a huge crater and as the perfect name says the ‘Eye of the Sea’. It is an hour drive by the car from Zakopane. But it’s a full day walk to the peak so we eagered to be there early. Starting the day early gives you a free entry too (we didn’t know there was an extra charge for taking the trail). We started the mountain trail at 8 a.m. and we walked into the mountain park without any fees. The morning walk is a great opportunity to escape from people crowds. Which usually starts at a midday. Our walk to the lake was peaceful and essential with an uprising sun through the trees. It takes about two-hours walk to the lake, each way. But it is it definitely worth the time to get there. The winter season in High Tatras gives you an opportunity to walk through entire lake, not only to check the view point close to the lake near hut. After crossing the lake you can either choose to go further to one of the summits or either walk around the lake. Latter was our choice. Being lucky enough we saw a purpose of a couple in the middle of the lake. We greet them with shouts and claps. But we weren’t surprise why the guy have chosen the day, it was 14th of February, the lovers day. We walked a bit and then had a really short lunch (accidently we forgot to take our sandwiches with us and all we had was some coffee, nuts & dried fruits) we start our walk back. The ‘marathon’ of the people was already started. Crowds were going to see the lake or drink tea inside the hut. But the peacefulness of the place revealed undisturbed. We slowly started to walk back down to the valley when we saw an unpleasant thing. Most of the people didn’t bother to walk to the peak. They were carried to the top by two horse sleigh. The number of sleighs stunned us. Just on the mountain trail we counted more than 20 sleighs and we saw more than 10 waiting at the parking lot. Now we know, it’s a popular tourist attraction in Zakopane. But we roundly condemn any animal abuse. Please be aware of attractions you choose while traveling. Tourist spend long evenings at the old town in Zakopane. So we went along with the tradition and tried Oscypek from local market. It is a smoked cheese made of salted sheep milk in the Tatra Mountains region of Poland. It is a local staple food and you will find stalls selling it all over the town of Zakopane. The recipe dates back to the 15th century and you can only find this cheese in this region. It is made in small quantities and it is usually eaten with cranberries jam same as a camembert cheese. If you are a fan of cheese or any kind of food lover, that’s what we recommend you to try. The second day of our trip was more adventurous. And you know what, only the bad situations can reveal underlying truth about the person. We were ready to storm the summit Kasprowy Wierch (1908m), but we had some difficulties. The morning was murky and foggy. So we had to plunge our feet into the slushy snow when we started the trail. Leaving the wet footprints behind us. We didn’t bother about it too much. Because we knew there was cable car going to the top so we thought we could jump into it at the middle of the trail if the road wouldn’t change to any better. But we were wrong so wrong. The truth indeed was that the cable car stops at the middle of the mountain and people go from one cable car to another, but it has no access from the outside! We felt a bit sorry for our friends who were considering the idea of getting to the top this way. After all, we knew we couldn’t waste our time: the day time was short and we wanted to reach the peak at the sunlight. The trail conditions transitioned from wet and slushy snow to snowdrift. We tried to be careful and slowly followed the tread path. The mist covered all the valleys and we could barely see each other from a distance, not mentioning any landmark except that small path. But eventually it ended as well. 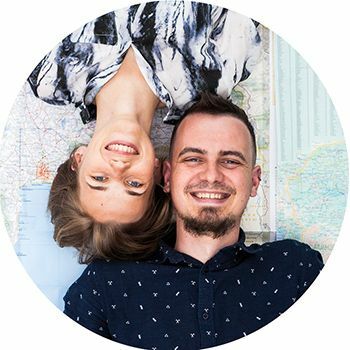 We met the polish couple who were lost and we followed their path! What a tremendous situation, right? We were lucky enough to have an app which showed us the trails on the mountain. So we started to make our own path through the snow. The snow depth varied. While treading the path snow was covering our legs till knees or sometimes it even reached our waists. After a while more people catched up with us and eventually we were leading the group of 14 people. Later on we found fox traces and we decided to follow it. We hoped fox ought to walk the same paths on winter and summer seasons, but we were more than happy to finally meet polish hikers coming down from the peak. They informed us that the trail to the peak is covered with ice and we need to have spikes on our shoes. But they also told us that if we were lucky enough we could climb by following their footprints. Another long hour passes. We finally saw the hut on the top of the mountain and we knew that the adventure was over. Clambering to the peak was difficult for all of us. But the adrenaline was flowing to our veins and we felt that we accomplished something good. Looking from today’s perspective who knows if we would repeat that experience. Thank you Frank very much for your compliment! It means a lot for us, because we just started. We want our website to be a bliss for our readers, so we put our hearts into both what we do: photography and writing.